A friend of mine sent me this link yesterday. Wow. I had been looking for inspiration for a friends birthday card.. and this was it. Spots made using cotton buds and the ends of wooden kebab sticks. ETA: I've entered this one into the CAS-ual Fridays Birthday challenge - thanks for the heads up, Tara! This one is based on last weeks Less Is More sketch again... which I am going to come back to time and time again, I'm sure! Hope you all have a lovely bank holiday weekend. I just need to finish packing my things, and I'm off for the weekend! Wow M, love your cards. The colours are fantastic, just like a rainbow! Well done on winning, it feels great to win something, doesn't it? It's real recognition for your cards. 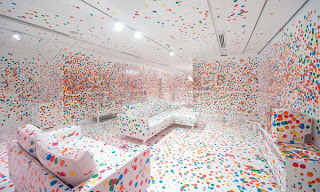 I love the inspiration photo - could do with a room like that to thrash out my tensions! I really how you've interpreted it too - inspired idea to use cotton buds and kebabs as ink dabbers. You could enter the birthday one into this week's CASual Friday challenge as it certainly fits the bill. Great inspiration picture and great makes using it!! Well done on your win. It doesn't matter how many entered .. you won and that is great so don't let your exciting be dimmed! Hope you are having a good Bank Holiday weekend. I love all the confetti...so cheery and fun! Thanks so much for playing with us at CAS-ual Fridays! Fabulous inspiration photo and card. Great job! So glad you could join us this week at CAS-ual Fridays!